Gossip is a little program which can be used to keep abreast of the latest postings on any Internet site which supports a news backend file. 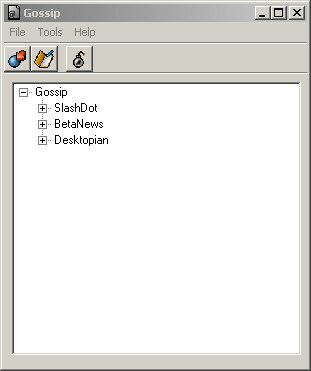 Gossip is capable of interpreting the contents of both RSS (Resource Description Framework (RDF) Site Summary) and three-line simple text news backend files. 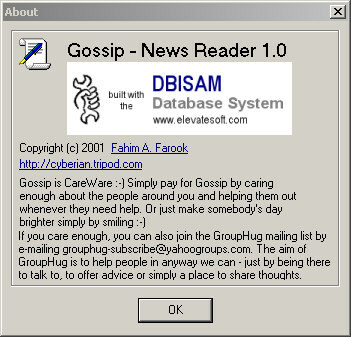 Gossip will fetch the contents of the news backend file for all the sites you've defined, display the headlines in a tree structure and launch your browser with the appropriate url when you double-click the appropriate headline. Unlike most other programs which monitor the news sites constantly for changes, Gossip currently does no monitoring at all. It will fetch the headlines when you ask it to update them but otherwise will remain inactive. This might change in the future depending on user feedback. A very small self-contained program. You can define as many news backend sites as you want (in additioned to the pre-defined sites that come with Gossip) as long as they support the formats recognized by Gossip. No need to have multiple browser windows open to check on the news from your favorite sites - all the headlines are displayed in one simple window. Unsupported backend formats give errors or display strange results. The program has no option to automatically dial-out and so you need to be connected to the Internet to retrieve headlines.